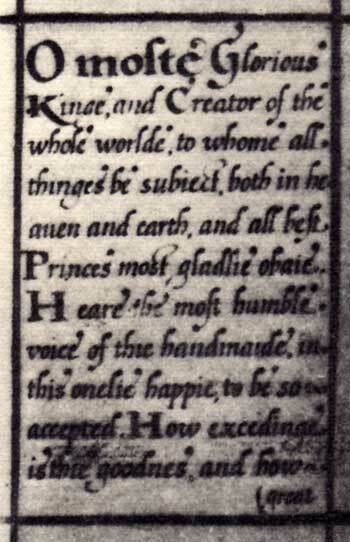 A Queen's prayer from 1570 - pertinent for today? Nearly a week of mostly sunny days have been a heaven-sent blessing. Local farmers sepecially have needed this dry spell as their fields have been totally waterlogged. 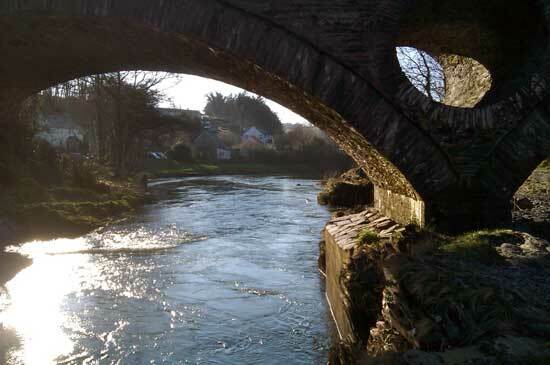 The River Teifi has finally fallen back to normal levels here at the old stone bridge in Cenarth, a few miles upstream from us. 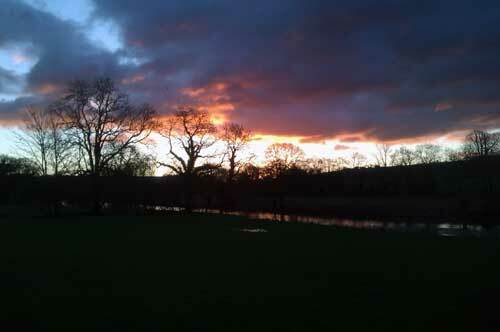 And we hope that a recovery from the wettest period in years is now underway. We recently visited with friends in Devon who lent us A Book of Devotions, containing prayers written by Queen Elizabeth I. Her tiny handwritten book, only 3 inches high and 2 inches wide, was for her own personal use. I have found the prayers to be both inspiring and heartbreaking. Here is the first prayer that will excercise your English, and hopefully your spirit as well. O Most Glorious King, and Creator of the whole world, to whom all things be subject, both in heaven and earth, and all best Princes most gladly obey, Hear the most humble voice of thy handmaid, in this only happy, to be so accepted. How exceeding is thy goodness, and how great mine offences. Of nothing hast thou made me not a worm, but a Creature according to thine own image, heaping all the blessings upon me that men on earth hold most happy. Drawing my blood from kings and my bringing up in virtue; giving me that more is, even in my youth know ledge of thy truth : and in times of most danger, most gracious deliverance: pulling me from the prison to the palace: and placing me a Sovereign Princess over thy people of England. And above all this, making me (though a Weak woman) yet thy instrument, to set forth the glorious Gospel of thy dear Son Christ Jesus. Thus in these last and worst days of the world, when Wars and seditions with grievous persecutions have vexed almost all Kings and Countries, round about my reign hath been peaceable, and my realm a receptacle to thy afflicted church. The love of my people hath appeared ﬁrm, and the devices of mine enemies frustrate. Now for these and other thy benefits (O Lord of all goodness) what have I rendered to thee? Forgetfulness, unthankfulness, and great disobedience. I should have magnified thee, I have neglected thee. I should have prayed unto thee, I have for gotten thee. I should have served thee, I have sinned against thee. This is my case. Then where is my hope? If the Lord wilt be extreme to mark what is done amiss, who may abide it? But thou art gracious and merciful, long suffering and of great goodness, not delighting in the death of a Sinner. Thou seest whereof I came, of corrupt seed: what I am, a most frail substance: where I live in the world full of wickedness: where delights be snares, where dangers be imminent, where sin reigneth, and death abideth. This is my state. Now where is my comfort? In the depth of my misery I know no help (O Lord) but the height of thy mercy, who hast sent thine only Son into the world to save sinners. This God of my life and life of my soul, the King of all comfort, is my only refuge. For his sake therefore, to whom thou hast given all power, and wilt deny no petition, hear my prayers. Turn thy face from my sins (0 Lord) and thine eyes to thy handiwork. Create a clean heart, and renew a right spirit within me. Order my steps in thy word, that no wickedness have dominion over me, make me obedient to thy will, and delight in thy law. Grant me grace to live godly and to govern justly: that so living to please thee, and reigning to serve thee I may ever glorify thee, the Father of all goodness and mercy. To whom with thy dear Son, my only Saviour, and the Holy Ghost my Sanctifier, three persons and one God: be all praise, dominion and power, world without end. AMEN. Apparently people have considered their times to be "the last and worst days of the world" for quite some time. Wouldn't it be awesome if our current national and international leaders were to have this kind of heart for God and the people they govern? That is a worthy goal for our prayers! How about a little horsemeat? I must confess I've had to laugh a little bit about the growing horsemeat scandal here in the UK and some European countries. We didn't hear of this until recently when BBC news reported that a French company was exporting frozen beef lasagna that had been found to actually contain 100% horsemeat. According to one news report, "One of Britain's biggest supermarket chains has said that some of their frozen Everyday Value Bolognese and other beef products may contain more than 60% horsemeat." 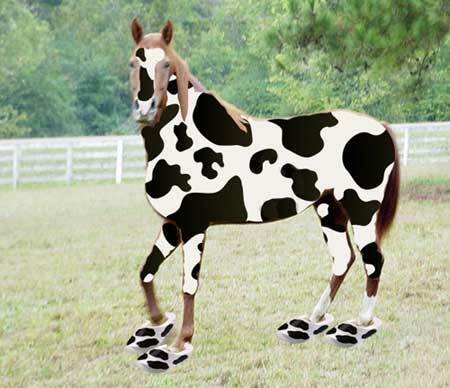 And even Burger King has found their reputation sullied after being involved in the horsemeat-in-burgers scandal. Chances are that they weren't aware of the problem until it was discovered. But someone somewhere along the line surely knew, and was making a little extra profit. Misrepresentation on such a scale is no laughing matter. It is not acceptable practice on any scale. Jesus was no stranger to this problem. He talked about it quite frequently. Mathew 23:1-3 says, "Then Jesus spoke to the multitudes and to His disciples, saying: "The scribes and the Pharisees sit in Moses’ seat. Therefore whatever they tell you to observe, that observe and do, but do not do according to their works; for they say, and do not do. " When we tell others that we are Christians, we are making a large statement. That means our goal is to become like Jesus, to reflect His character. We are His representatives to this world. Paul says in 2 Corinthians 5:17, "Now then, we are ambassadors for Christ, as though God were pleading through us: we implore you on Christ’s behalf, be reconciled to God." As such, could we perhaps be unaware of any misrepresentation on our part? Are we getting closer to Him day by day? How completely do we "walk the talk?" Romans 12:1-2 sets a good standard. "I beseech you therefore, brethren, by the mercies of God, that you present your bodies a living sacrifice, holy, acceptable to God, which is your reasonable service. 2 And do not be conformed to this world, but be transformed by the renewing of your mind, that you may prove what is that good and acceptable and perfect will of God." I couldn't help thinking that this is good food for thought! REDEEMED => Rees Howells' Bible College of Wales! You will probably remember that nearly two years ago we asked you to pray with us for grounds of the Bible College of Wales. The property had been put up for sale on the open market. People whose lives have been impacted ed by Rees Howells' life as an intercessor have offered up earnest prayers from across the nations. And in this photo you can see the tangible answer to those prayers of faith. 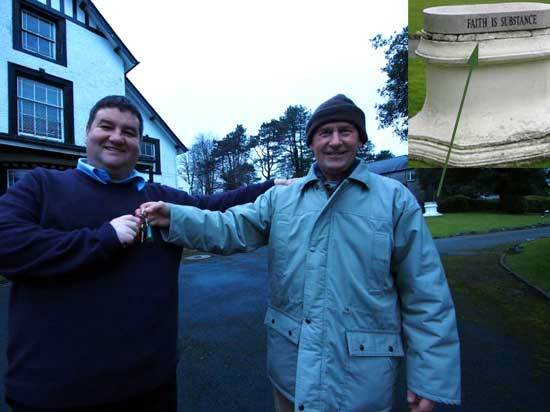 The keys to Derwen Fawr, the main property of the college, are being handed over to Mark Ritchie. He is the director of the "Reclaiming Our Inheritance" project at the BCW grounds. The property was acquired on December 21st 2012 as an initiative of the Cornerstone Community Church of Singapore. As part of a prayer meeting there in March of 2011, groups of us walked and prayed around the land. 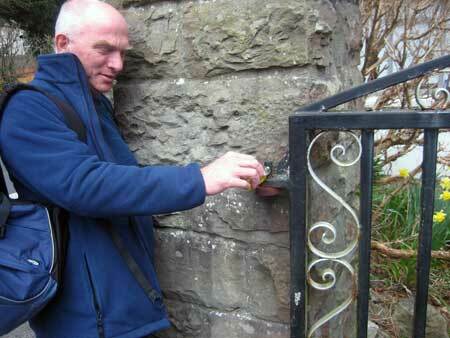 Here is one of our friends oiling the hinges of the locked gates as a prophetic act and declaration. I wrote about that meeting in my update on that same day which you can read here. And just two days ago I had the enormous privilege of entering those gates which now wide open! That part of the land has been "redeemed" into a secure future in the body of Christ and God's plans. Interestingly enough, it was that same email update that was forwarded on to the pastor of the Cornerstone church, and God started answering years of prayers, including yours. People from Cornerstone got in touch with us and then came to see the property in Swansea. Since then we have developed wonderful friendships with the senior pastor and his wife, as well as other pastors and members of the church. So this is all very exciting news indeed! You can read the amazing story of how this all came about on Cornerstone's "Reclaiming Our Inheritance" webpage. You can also keep up with current happenings, hear the vision, and maybe even recognize a few friends on a Facebook page the BCW team in Swansea have just posted! Gladys and I have been praying with a group called The Forge since April 2011 about the heritage of Rees Howells. This means far more than just these properties, purchased as the result of a tremendous gift of faith. The real heritage is learning how to live a life of intimacy with God and sacrificial obedience to the Lordship of Jesus, and to become His instruments, personally and corporately, for reaching out to a lost world with life-changing Gospel power and world-changing intercessory prayer. Prayer is what made possible the acquisition of part called Derwen Fawr by our friends from Cornerstone Church. And more prayer will make possible the purchase of the remaining half across the road, Sketty Isaf, which is still up for sale. We believe this also is going to be redeemed, and that the fullness of God's purpose and vision for the whole will come to fruition in the near future. Thank you for praying with us to this end!